Apple will today release the 9.7-inch iPad Pro to the New Zealand market, billing the standout new device as a replacement for PC users. With over 600 million PCs over five years old currently in the marketplace, the tech giant says the all-new 9.7-inch iPad Pro is targeting current Windows users, as well as existing iPad customers. “iPad Pro is a new generation of iPad that is indispensable and immersive, enabling people to be more productive and more creative,” says Philip Schiller, Senior vice president of Worldwide Marketing, Apple. “It’s incredibly fast, extremely portable, and completely natural to use with your fingers, Apple Pencil and Smart Keyboard. And now it comes in two sizes. “The 9.7-inch iPad Pro has a new Retina display with True Tone technology, four-speaker audio system, blazing fast A9X chip, 12-megapixel iSight camera, 5-megapixel FaceTime HD camera, faster wireless, and support for Apple Pencil and Smart Keyboard. Schiller says the new iPad Pro delivers improved performance with the 64-bit A9X chip that rivals most portable PCs, along with a four-speaker audio system that is twice as powerful. Additional standout features include the new 12-megapixel iSight camera for shooting Live Photos and 4K video, 5-megapixel FaceTime HD camera, and faster wireless technologies. 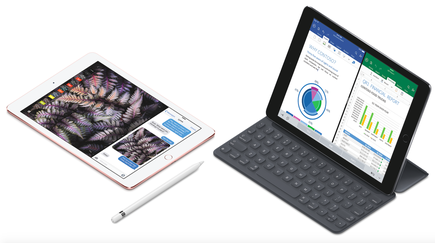 Also, the iPad Pro includes support for the breakthrough Apple Pencil and a new Smart Keyboard cover designed to fit the new 9.7-inch iPad Pro. In a big plus for creative Kiwis, Apple Pencil and Smart Keyboard, available for purchase separately, bring breakthrough levels of precision and utility to iPad Pro. Advanced sensors in Apple Pencil measure both pressure and tilt for a natural drawing, annotating and note-taking experience. Schiller says a new Smart Keyboard is custom-designed for the 9.7-inch iPad Pro, offering a “thin yet durable” keyboard that never needs to be charged or paired over Bluetooth, while being easily foldable into a protective Smart Cover. Delving deeper, the new Lightning to SD Card Camera Reader and Lightning to USB 3 Camera Adapter offer better downloading of photos and videos from a digital camera to the iPad Pro, while a new Lightning to USB-C Cable and Apple’s 29W USB-C Power Adapter enable faster charging. As Schiller points out, designers, illustrators and businesses have quickly adopted iPad Pro and “it’s changing the way they work”. “People don’t realise how much hand drawing is needed to produce computer animation,” adds John Lasseter, Chief Creative Officer, Pixar and Walt Disney Animation Studios. Read more ​With businesses offering device choice programs, what are employees choosing? 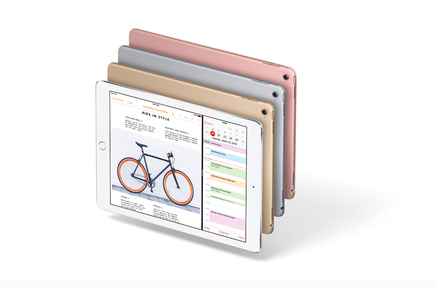 In New Zealand, the 9.7-inch iPad Pro comes in silver, space gray, gold and a new rose gold metallic finish, and is available from a starting price of NZ$1,049 for 32GB on WiFI. Additional pricing options around storage and connectivity include NZ$1,329 for 128GB and NZ$1,599 for 256GB Wi-Fi models, as well as NZ$1,269, NZ$1,549 and NZ$1,819 for 32GB, 128GB and 256GB on Wi-Fi and Cellular models.